GOP Sens. Rubio, Paul Square Off Over Cuba Policy Shift : The Two-Way Rubio, appearing on ABC's This Week, lashed out at Paul, who has expressed support for opening trade with the island nation after a decades-long embargo. 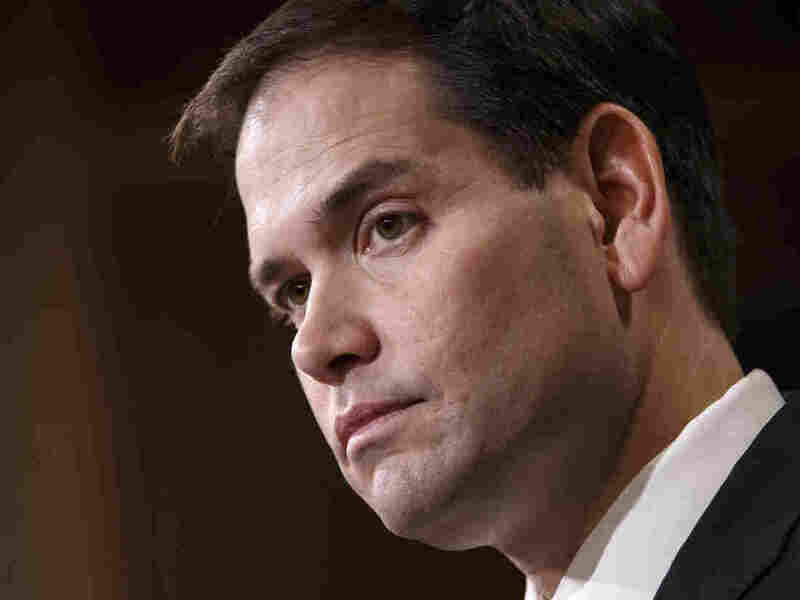 Sen. Marco Rubio, R-Fla., the son of Cuban immigrants, expresses his disappointment in President Obama's initiative to normalize relations between the U.S. and Cuba, on Wednesday. In what could prove a sneak peek at the 2016 Republican presidential primaries, Florida Sen. Marco Rubio, a strong critic of President Obama's decision to open relations with Cuba, appears to be stepping up an attack on fellow Republican Sen. Rand Paul over his support of the policy shift. Speaking to ABC's This Week today, Rubio, who is of Cuban descent, took the Kentucky senator to task for supporting the new U.S. policy. Both lawmakers are considered potential White House contenders. Rubio reiterated his displeasure with the president's decision, calling it "absurd." He said Paul had become Obama's "chief cheerleader." Last week, Paul told a West Virginia radio station that starting trade with Cuba is "probably a good idea." "Rand, if he wants to become the chief cheerleader of Obama's foreign policy, he certainly has a right to do that," Rubio said after This Week host George Stephanopoulos asked about the growing feud between the two senators over Cuba policy. "I'm going to continue to oppose the Obama — Obama-Paul foreign policy on Cuba because I know it won't lead to freedom and liberty for the Cuban people, which is my sole interest here," Rubio said. On Wednesday, the president announced the historic shift in U.S. policy. For more than five decades, the U.S. has maintained a commercial, economic and financial embargo on Cuba and isolated the nation diplomatically. The tense relations were triggered by Cuban leader Fidel Castro's communist revolution that in 1959 overthrew the regime of dictator Fulgencio Batista, who enjoyed U.S. support. Relations continued to sour as the Soviet aid went to Castro's government and a CIA-sponsored invasion of the island at the Bay of Pigs failed in 1961. A year and a half later, the U.S. and USSR nearly came to war over Soviet missiles based in Cuba. The so-called "Cuban Missile Crisis" ended with Moscow withdrawing the weapons.